All audiovisual systems have something in common, no matter how simple or complex they may be: a control system. A/V control systems can range from a simple wall switch to a complicated Visual Basic program embedded inside a Power Point presentation. The extent of the control system often depends on the audio and video system itself. In its simplest form, control systems are a series of relays and switches which allow you to turn things on or off from a remote location. This saves you the trouble of going back and forth to an equipment rack every time you need to make an adjustment. Quite useful if the rack is in another room! While there are many options for developing a solution, we prefer designing a dedicated control system with a simple user interface. Let’s start with an example of an A/V control system which many of us can relate to. Imagine using Velcro to bundle your TV, cable, VCR and home stereo ‘clickers’ together. You would now have a single control system that lets you handle all the equipment in your home entertainment center. The advantage to this system is that all the clickers would be in one location and should be more difficult to lose. The disadvantage is that the bundle of remotes will be large and bulky. It would also be hard to learn how to use, and you could no longer hold it in one hand. To make things easier, you can try using a “Universal Remote”, the aftermarket type which combines your other remotes. But while that’s fine for most home systems, the A/V system in a corporate board room is much too complicated for one of these devices. Imagine a universal remote trying to handle the functions for two TVs, four VCRs, a sound system, a computer graphics projector, and a video or teleconferencing system. In addition to this equipment, there are the other aspects of the room to control: drapes, a projection screen, and lights. Can you picture a CEO fumbling with several different remotes just to view a video presentation? After investing in a state of the art A/V system, it makes sense for the user to have an easier way to handle its functions. Therefore, a custom control system is designed to give the user a simple way to control a complicated set of tasks. A/V equipment is generally controlled using one of three methods: Contact Closure, Wireless, or Computer Interface. A Contact Closure is the simplest method of controlling a device. This is basically a relay which the control system turns on and off. These work best with simple mechanical things like motorized drapes, a retractable projection screen, or a motorized projector lift. Wireless control systems utilize infrared (IR) or radio frequency (RF) signals. The remote controls for most home theater and stereo equipment use this type of device. Professional control systems can also be programmed to beam IR signals to a device. However, these systems lack the capability of interactive response. This means that although the wireless control systems can tell the VCR to play a tape, it can’t actually tell if the tape is playing, or even if the equipment is turned on. Computer Interfaces are usually a standard serial port similar to what a computer’s mouse plugs into. Most professional audiovisual equipment uses a computer interface because it provides two-way communication. This allows for status feedback reports which tell if the system is on or off, playing or stopped, and which other functions are active. How Do I Control The Control? The previous control system descriptions cover the units which send commands to the equipment. But in order for these to send the correct commands, they need input from the user. The simplest user interface is a single button. Since there is usually more than one function necessary to run a system, more than one button will be needed. Several buttons can be placed in a Button Box and be wall-mounted, desk-mounted, or even placed in a hand-held remote. This type of user interface is fairly economical, and most appropriate if there are only a few functions to be controlled. Button boxes are used mainly for slide projectors, lighting, volume, or motorized drape control. For a more complex system we can use a Graphical User Interface (GUI). Basically, this is a screen with button-sized graphics that represent a range of control functions. For the GUI to work as an A/V control we typically use a touch panel, a very flexible and increasingly popular interface. A touch panel is an LCD screen with a pressure sensitive surface. You just touch a specific graphic on the panel’s screen to select what you would like to control. For example, if you wanted to play a video tape, press the button that looks like a VCR. To raise the sound level, push the volume bar up higher. Want it quiet? Drag it down a little lower. Also, if there are more GUI ‘buttons’ than can fit on one screen, hidden screens can be called up to control different groups of functions. For instance, after selecting the VCR graphic, the VCR controls (play, stop, pause, etc.) are displayed. However, touch panels are only as good as the GUIs that are designed for it. If a person cannot understand the icon, the system design will not function as hoped. To design a successful control system, we need to be part engineer to make it work, part designer to make it usable, and part software programmer to tie it all together. Newer touch panels allow real-time computer and video to be displayed along with the panel’s ‘buttons’. Video display is beneficial to anyone who wants to view a conference or presentation while controlling it. This is also a boon to people who want a computer mounted inside a podium, but no computer monitor on top of the podium. Touch panels can even incorporate a wireless control signal and be wall-mounted or desk-mounted. The most complicated control system to implement uses a computer. This usually involves a custom programmed computer interface. Actual computer control of an A/V system is a fairly new concept for most of the industry. The advantages of this are similar to that of touch panels; putting small pictures of devices on a screen, and having many screens to control many functions. A computer interface can be designed to work via a local network, or even over the Internet. Before you get too excited, remember we are talking about control, not output. Therefore, it is possible to use the Internet to tell a VCR to play from halfway around the world. But you still aren’t going to see what the VCR is playing. Specific uses for this type of system are still emerging as networks are growing. Remember, even though an audiovisual system may be crucial to a presentation or conference, the control system is central to the success of that audiovisual system. Sometimes, a simple control will suffice. For larger systems, more complex controls with simple user interfaces are needed. The specific style of the control system should be matched carefully with the user’s requirements. What’s the difference between a theme park and a corporate conference room? Not as much as you think. This might sound like some kind of bad joke at first, but when you look at the requirements and designs for their audiovisual systems you’ll realize that these opposite environments actually share some common ground. What are the goals of an audiovisual system in a conference room as compared to a themepark? In relation to audio, the systems for both are expected to be clear and intelligible for everyone in a desired location. The sound system should be able to reproduce vocal tones, music or sound effects in a specified area without affecting other nearby areas. Distributed sound systems are preferred over loudspeaker clusters for multi-room or low ceiling height spaces because they can provide a more even coverage while running at a lower volume. Whether indoor or outdoor, a distributed system is an ideal choice for paging, background music or announcements. In a corporate setting, distributed systems are also used for teleconferencing, video conferencing, or speech reinforcement during presentations and training seminars. Themeparks use distributed systems for background music, pre-recorded announcements, paging and narrations at certain attractions. Loudspeaker clusters are more common in themed environments for live or pre-recorded stage shows that rely on foreground music. They are also effective for localized displays such as a video wall, or a projection screen found in screening rooms and corporate auditoriums. Performance audio systems for both theme and corporate auditoriums are scaled depending upon the seating capacity of the room. Corporate facilities are now asking for surround sound systems to recreate the experience they get from home or specialty theatre systems. Video requirements differ slightly between the two except for the number of displays. Most conference rooms may employ one or two screens for presentation or video conferencing purposes. Themed video systems can employ dozens of screens for the queue areas with video walls in the main entertainment area; the focus is on entertainment as opposed to a utilitarian approach (whatever gets the job done). One other slight difference is that themed video systems use primarily video sources, while corporate systems display both video and computer graphics. Many of the basic components used in conference rooms are found in theme parks: microphones, amplifiers, compressors, EQs, VCRs, cassette or CD players, loudspeakers, digital video sources, computers, CRT/LCD/DLP projectors, monitors, etc. While these components serve the same functions for both environments – if you consider ride narrations and stockholder updates as similar – some equipment has to be modified for use in theme parks. In a previous blog post we discussed hiding AV components in conference rooms so they wouldn’t become a distraction. That same theory applies to theme parks. The less distracting a particular piece of equipment becomes, the more your guests can enjoy the overall ambiance of a facility. This is extremely important in a place built around a particular theme, whether it’s faux countryside settings, cartoonish cities, alien planets, fishing villages or wild west building façades. 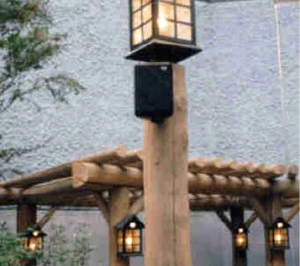 In an area accented by frontier overhangs, decorative lights and trees, a minimal amount of effort could have hidden the loudspeakers mounted on this pole. Instead, it is plainly obvious to the park’s guests. Unlike a conference room, blending equipment into a themed environment requires more than motorized screen lifts and matching wood casework. Loudspeakers seem to stand out the most because theme parks need so many of them. Manufacturers have created some which are colored to blend into foliage, and others which actually look like rocks. But unless the loudspeaker is mounted at ground level, a certain amount of creativity will be needed when choosing a location for any non-themed unit. In addition to needing to blend in, themed equipment must also be built to take an enormous amount of abuse. This can come in the form of physical contact (components shaken in ride cars or left within easy reach of vandals) and extreme environmental conditions (water-soaked ride areas, or ultraviolet exposure and temperature changes experienced by outdoor systems). Control and media playback units must be able to endure continuous use, from the opening to the closing of the park. Compared to business systems that are safe and secure in a temperature-controlled building, themed systems are the 4×4 monster truck of the AV world. An example of proper theming, if you can find the loudspeaker hidden in the rocks along this boardwalk let us know. • Source Material: Conference rooms may be limited to a few things such as computer graphics, a VCR and microphones. Themeparks may have all those in addition to multiple video inputs, sound effects, pre-recorded soundtracks, announcements, CDs for background music, and much more. Next time you find yourself at an amusement park, see how many different sources you can identify in any one area. • Controls: Have a look at a touch screen control panel in an office and compare it too the heavy toggles and buttons on a control panel at an attraction. Presentations and teleconferences don’t take place nearly as often as a show or ride turns its crowd over. Exposure to the elements is also a consideration, as we mentioned before. • Noise Levels: Conference and presentation rooms are normally very quiet places. Background noise levels are low because the walls are constructed to keep the meetings private; high sound isolation ratings ensure minimal sound transfer. On the other hand, the chaos at an amusement park is hard to escape. Between the screaming children and mechanical noise from the surrounding rides, it’s a wonder conversations can even take place. Sound system designs must take this into consideration. Ambient volume sensors could be used to assure audio broadcast levels are adjusted to suit a particular zone’s noise level. • Sight Lines: Conference rooms are usually made to hold a few dozen people; seating is wellspaced and obstructions are not common. This is quite unlike the hundreds (or even thousands) of bodies you’ll find crammed near a display area in a theme park, each edging for a better view. Sight lines become very important at this point. The wrong initial calculations can leave guests staring at a support pillar or the backs of the people’s heads in the preceding row. With the pace at which technology has been advancing, it is vital to make concessions for future breakthroughs. A decade ago DVD and Plasma screens would never have been seen on an equipment list. A decade from now who knows what new audiovisual equipment will share a rack mount with the current components. Whether it’s a corporate or themed project, the best way to plan for the future is to leave enough space for the system to grow and expand. We’re proud to announce that Steven J. Thorburn received the ’96-’97 ICIA Professional Education and Training Committee (PETC) award at the 10th annual ICIA Achievement Awards Presentation. This year’s ICIA (International Communications Industries Association) awards ceremony was held during the recent InfoComm International trade show in Los Angeles. A note for anyone who attended that show: the Ultimate Digital Theatre, located upstairs in the convention center, showcased not only the newest digital technologies, but some examples of Steve’s acoustical work as well. Founded 58 years ago, the ICIA is an organization which has supported the audiovisual industry from the early days of film and slide to today’s computer and video industry. Their PETC award is given to recognize a person whose continued participation in education and training within the communications industries promotes the newest technologies and methods, provides methods to successfully compete in the global market, fosters professionalism within the trade, and promotes the industry as an exciting career opportunity. By whatever name you call it: Fiberboard, Beaver board, sound-deadening board, CelotexTM, or HomasoteTM, this material seems to be making a comeback with potential acoustical uses. But before you decide to add it to your next project, you should know that this compressed fiberboard does not add any positive acoustical effects in most constructions. We have found that, with a couple of exceptions, replacing the fiberboard with a gypsum board product or plywood usually results in a higher-rated acoustical construction. Let’s start out by examining wall assemblies. The original sound tests using fiberboard were done under a now-obsolete 1967 standard. In this test, the fiberboard and gypsum board were glued to the framing studs. An analysis of the test results shows that the fiberboard provided some (but not all) of the benefits resilient channels are known for. This installation method is the main weakness with that acoustic test. Most building inspectors in California will not allow you to glue fiberboard to the wall and then glue gypsum board over it. In fact, when was the last time you built a wall by simply gluing it together? Some type of mechanical connection is required to bond the layers, even when resilient channels are used. This is also important to consider from a longevity point of view. But as with resilient channels, mechanical connections need to be carefully installed to avoid compromising the acoustic benefits of the assembly. When attaching the gypsum board to the resilient channel, any screws which accidentally connect with the framing members will short-circuit the assembly by locking the resilient channel in place. Once this happens, all flexibility is lost and the channel is worthless. Likewise, if we screw the gypsum board into the framing member behind the fiberboard layer, then the resiliency found in that original glue-up test will be lost. On the other hand, if you actually plan on driving fasteners through the board layers and into the framing, you would be much better off simply replacing the supporting fiberboard with another layer of gypsum product. A thicker version of a fiberboard panel is sometimes used for a subflooring system in wood frame constructions. While its fibrous composition might help reduce some footfall noise heard between stacked units, it is too lightweight to act as a barrier material in the same manner that a plywood subfloor with lightweight concrete or gypcrete would. In these cases, the advantage of using fiberboard is offset by the limited number of facilities where it will make a difference. Using fiberboard as a carpet underlayment also provides mixed results. We have found that applying fiberboard on top of a floor system provides no additional sound isolation from unit to unit. If the carpet is thick and well-padded, the footfall noise or impact isolation of a floor/ceiling assembly is not significantly affected. However, as an underlayment for thin or lightweight carpets without pads, the HomasoteTM product would help reduce impact noise into the room below. One important precaution to observe with fiberboard is keeping the material dry during construction. We were called upon to provide expert testimony for a project where a contractor had substituted (without the architect’s permission) fiberboard for a floor design system of plywood and gypcrete. During a rainstorm the floor system was allowed to get wet, causing the fiberboard to expand and buckle. In the long run, the pending lawsuit claimed acoustical, structural, and numerous additional damages because the owner was not happy with the finished product. Needless to say, had the original design detail of a plywood subfloor with a gypcrete system been utilized, much of the unevenness caused by water damage could have been avoided. Also, certain acoustical problems in the facility might have been avoided as well. Don’t get us wrong; as part of a construction crew during high school and college many of the first buildings we worked on in Michigan used fiberboard as an infill underneath the exterior sheeting. In this geographical location shear plywood is not required along the entire exterior wall — only at the corner. While fiberboard can be useful for replacing plywood or gypsum board in some assemblies, we feel that its true acoustical values are extremely limited. This is basically because it is too rigid to act as a resilient connector, and not absorptive enough to substitute for an absorber such as batt insulation. One issue that we face with our projects is making technology transparent within the space it occupies. For many projects, the end users and owners want to see the audio and/or visual systems they spent their money on. They want to showcase their system and make it a visible focal point of the facility. But other clients view the system and its individual components differently; the technology is there to serve a purpose, not create a distraction or act as a decoration. Their conference room can be filled with any of the latest technologies, just as long as the equipment blends into the surroundings. Whether you want to showcase the presentation system or camouflage it, some common issues need to be addressed: wall mounted controls, projectors and screens, loudspeakers, microphones, and user-accessible equipment. Often when you walk into a room you will see an array of wall-mounted devices. How many times have you seen an on/off light switch, dimmer, exhaust fan switch, projection screen control, and remote volume control on five different wall plates spread out over three feet of the wall area? One wall plate is silver, one is an ivory toggle, one is a gray decora, and the others are some shade of color that almost matches the wall paint. These multiple functions should have been combined into a single faceplate-which hold from one to four switches- with labels clearly identifying each button. These plates come in a variety of colors and finishes. Grouping and naming the switches is a simple idea that will save frustration (and embarrassment) when you try to dim the lights and instead change the temperature in the room or kill the power to the projector. If the system is very complex, the push buttons and switches can be replaced with a small LCD touch screen control. This detail is just one of the responsibilities of the audiovisual design consultant. Clients who want to view large images in the conference room need to make a choice between using a projector or a large monitor. The number of people that need to see the image, and the type of image (high resolution for computer graphics or lower resolution for general video viewing) helps to determine the type of display device used. Projection screens obviously come in larger sizes than monitors and are favorable for reaching bigger audiences. However, both projected and direct view displays have their own requirements for integrating a system within the room. Ceiling-mounted projectors are bulky and can be a visual distraction from a room’s design. While their size makes it difficult to hide the entire unit, the projector could be housed in a soffit or lowered from the ceiling by a mechanical lift. Large monitors that we typically find in conference rooms can weigh 250-350 pounds and could be up to 40 inches wide and 30 inches deep. Monitors this size can either set on the edge of a large credenza, or be integrated into the casework or furniture design. Smaller models can be placed on a platform that raises up from inside a credenza. However, the weights and dimensions for these monitors are larger than one would typically expect. Loudspeakers are another common component whose appearance can be easily minimized. Next time you are in a large office building or hotel lobby, look up at the ceiling. What do you see? A majority of the time, you will probably see two or three different types of loudspeaker grills within close proximity of each other. One will be for background music, the other might be for a fire alarm system, while the third is for the paging system. These loudspeakers serve three separate functions and were probably installed by three different contractors. Again, this is something the project’s audiovisual design consultant would have avoided by coordinating all these functions into one or two enclosures. If building codes prevent this, the grills could be coordinated so they all have the same general appearance. What about microphones? In the Summer 1993 issue of this newsletter we talked at length about how microphones really need to be on the conference table (as opposed to ceiling-mounted). The style and type of microphone selected should be dictated by its function and the number of people who will use it at any given time. A copy of the article can be found on our web site under the newsletter/article link, or give us a call if you need a copy faxed. There are two different sets of equipment for audiovisual systems. The first set is static equipment; power amplifiers, equalizers, switches, and other components that usually do not need adjusting after they have been set up. The second is comprised of all the audio and video sources: computer to video interfaces, VCRs, laserdisc or DVD players, cassettes, CDs, and slides. Each of these items must be accessible by all present including those in wheelchairs. In many cases, source equipment should be separated from the rest of the equipment, or at least located in the lowest portion of the equipment rack. So just how important is system/facility integration? With everyone going ‘on-line’ with greater frequency, many meetings are now relying on high technology presentations. In the corporate, training, education or boardroom setting, computer-based presentations are becoming the standard. Almost every student graduating with a technical degree-whether in business, engineering, or science-uses a computer. They are familiar with electronic presentations; their instructors have already been using this technology. As more and more educational facilities incorporate campus-wide networks and large screen display systems in their classrooms, students will assume that this is the norm for business environments. Firms almost always ask for large screen monitor displays for their conference and training rooms once they see their peers and competitors using similar systems. What is a sone? A sone is another one of the wonderful terms the acoustical industry has generated to confuse all of us. Sones are most commonly found in the rating of small fans; even more so for residential bathroom fans. Personally, we would not select a fan that is any louder than 2-1/2 sones for our home, which is a level that is noticeable but not objectionable to most people. To give you an idea about how loud a sone is, 6 sones is the level that we typically speak at when seated around a conference table. Keep in mind that noise is a subjective thing which varies depending on a person’s tolerance to such. One person’s Metallica is another person’s Mozart. The following table relates sones to A-weighted decibels. As you can see, sounds heard at 80dB are not merely twice as loud as 40 dB, but are actually 16 times louder! Insulation is all around us. Though we may not pay attention to the different types of insulation, we would certainly notice its absence. The main purpose of this hidden barrier is to secure a building’s interior temperature from the outside extremes, providing a savings in energy bills and a more comfortable atmosphere for those inside. The right kind of insulation can even increase acoustical ratings for walls and ceilings. When discussing “green insulations”, the term doesn’t refer to the color of the product, but to how environmentally friendly it is. Since insulation is so widely used and performs an ecological task, it makes sense that some brands are geared towards being safer for the environment. Many companies are following current trends in recycling by manufacturing insulations which either contain or are made entirely of reclaimed materials. Here’s a look at some of the more popular types of insulations and their acoustical properties. Possibly the most common insulation, fiber glass has long been known for its thermal and sound-reducing properties. The thick sheets of this fluffy material, called “batts”, are used in the interior of wall and floor/ceiling constructions. Fiber glass is basically composed of what the name implies: shredded glass fibers held together by a formaldehyde binding agent. The main ingredients in the glass are lime, soda, and ash–all natural resources. This alone doesn’t make fiber glass a green product, so some manufacturers have switched to using reclaimed industrial and post-consumer glass for their insulation. One company in particular has used over two billion pounds of recycled glass in the past five years. Some recent versions of fiber glass use alternatives to the formaldehyde binding agent. One brand substitutes an acrylic thermoset resin which has the same strengths as formaldehyde. Another brand avoids chemicals altogether by simply fusing two kinds of glass into thick curly strands. Fiber glass blocks up to 5 STC points of airborne sound when used for interior partitions. However, the installation of batts does pose a drawback. Rectangular strips of fiber glass don’t fit easily around pipes, junction boxes, or outlets. An unprotected gap in the insulation as small as 4% can translate into a 50% heat loss/gain through air infiltration while reducing the sound isolation properties by 1-2 STC points. A “sound batt” is a slimmer, denser version of the typical batt with extra binding agent. Although it is marketed for its sound isolating qualities, in reality it has little more effect than if a standard batt is compressed into the same area as the sound batt. Fabric wrapped pressed fiber glass panels are made specifically for sound control in a room. Resembling light-weight gypsum board, these panels are attached to the interior walls or ceilings of a finished facility. They provide additional thermal insulation while absorbing up to 50-75%, or 2-4 decibels, of the sound energy which strikes their surface. The sound boards come in various thicknesses and can be covered with a selection of patterned cloth for added acoustical and aesthetic effects. Closely resembling fiber glass in structure and function, mineral wool is actually composed of spun mineral fibers which produce a semi-rigid batt insulation. The fibers in these blankets form a highly complex structure which contain millions of air pockets that trap sound. The acoustical ratings for this insulation match or exceed those for fiber glass. Thermal properties for polystyrene (styrofoam) boards actually exceed those for fiber glass insulation by a wide margin. Unfortunately, a number of years ago styrofoam got a bad reputation when chemicals used in its manufacture were identified as ozone-depleting. The offending chemical, Chlorofluorocarbon (CFC), was replaced by its much less harmful molecular relatives, Hydrochlorofluorocarbon (HCFC) and Hydrofluorocarbon (HFC). Lately, even HCFC is being replaced by non-chlorine based alternatives. You can now use these foams to keep your building warm without worrying about heating up the rest of the Earth, too. Polystyrene’s greenest feature is the ease with which it can be recycled. Not only are its component materials reclaimable, but since styrofoam doesn’t deteriorate like most natural substances, the boards can be salvaged from one project and added to another. During construction these rigid boards are concealed inside wall, ceiling, or roof areas. The closed-cell fabrication of this hardened foam gives it a high moisture-resistance rating, allowing it to come in direct contact with subterranean backfill for basements constructions. However, a drawback to using this insulation is its combustibility and high rating for developing smoke in a fire situation. Acoustical characteristics for this or any closed-cell foam insulation are nearly non-existent. One of the greenest insulations, spray-on fibers contain cellulose, wood or paper pulp bonded by a vinyl acrylic adhesive. The mixture is then chemically treated to resist fire, moisture, and mildew. This final mixture is applied by spraying it either onto the interior of a finished building or between studs in unfinished wall and ceiling assemblies. Companies which make this insulation use anywhere from 50- 100% recycled fibers for the composition. Spray-on insulation ratings match fiber glass in a number of categories. The effectiveness of this system is partly due to its installation. The spray fills in cracks, irregular spaces, and around previously installed electrical and plumbing fixtures. Dead-air spaces between and within the cells of the fibers create a better trap for sound waves and a more solid barrier against temperature changes. The fire-resistant chemical blended into the spray composition gives it a fire and smoke rating comparable to fiber glass. Coating interior surfaces of a facility with spray-on material provides thermal insulation, absorbs 50-75% of the sound caused by reverberations, and can even increase the light reflectance rating. The bonded fibers will cling to any surface that latex paint sticks to, with a little priming for the more porous areas. Overhead applications can be up to three inches thick without the need for mechanical supports. This makes it a convenient addition after construction has been completed. If cotton cloth is good enough to keep your body warm, then it should be good enough for your house. No, they don’t make a giant shirt for your building. Instead, one industrious textile manufacturer uses its shredded scraps to create a non-toxic and itch-free alternative to fiber glass. The scraps are treated with a flame-retardant and formed into batt rolls with a kraft paper facing (like fiber glass) or blown into attics. The first thing you notice about this product is that it’s extremely soft, yet still resilient. Not only does this new form of insulation provide comparable noise reduction to fiber glass, but it is also completely biodegradable. The insulations discussed above are just a part of the growing movement towards green products. Conservation has become more popular due to the increasing awareness of how fragile our environment is. In response, more companies are looking for ways to provide Earth-friendly products. Many people are familiar with Liquid Crystal Display (LCD) as the innovation which made it easier to read a watch. Since then, the original monochrome image has blossomed into the full color spectrum. The advancement of its color technology has allowed LCD to spread far beyond watches and into other fields. To find out how big the LCD market is, just look at a laptop computer screen, a child’s hand-held video game, viewing screens on some video cameras, hand-held portable televisions, or seat-back monitors on airplanes. During the past few years, many companies have incorporated LCD into their multimedia presentation devices. Recent improvements let the units interface with a wide range of audio, video, and computer software systems. Whether used for educational, business, or entertainment purposes, LCD panels and projectors can help maximize the impact of any display. While panels and projectors share many similarities, it’s important to know their differences. LCD Panels are like an electronic version of the overhead transparency. They are flat screens whose image is projected by shining a light through it. Images on the screen are created by a grid of pixels, or individual points of color. The color screens have three overlapping layers of these pixels, one for each of the primary colors—red, green, and blue. The ability of a panel to create shade variations within the pixels determines its color scale. Depending on price, the color ranges start at a simple gray scale and can reach higher than 16 million colors. The image is cast onto a presentation screen using an extremely bright overhead projector. These are nearly identical to the overheads many people remember from their school days, the main difference being a much brighter light source. The bulb needs to be brighter because the LCD image blocks most of the light trying to pass through it, the more powerful the bulb in the overhead, the more vivid the projected image. LCD Projectors are self-contained units which handle both the image processing and projection duties. Some inexpensive models shine one light through a single miniature color LCD screen. Others filter the light source into its three basic spectral components using a series of dichroic mirrors. These mirrors allow one color to pass through while the remaining light is reflected towards other mirrors for further separation. Lenses in Blue Blocker sunglasses are similar to the glass in these mirrors. Once isolated, the three beams are sent through their own miniature gray-scale LCD screens, combined back into a complete color beam, and projected onto a presentation screen. Both projectors and panels achieve almost identical results. They have high resolutions (up to 1024 x 768 pixels in a screen), are able to show computer graphics as well as video, and can support a remote mouse control for connected computers. These units are even capable of reversing the image for rear projection applications. When it comes to portability, panels have an advantage. They are small-usually only a couple inches thick-and weigh less than 10 pounds. But portable overhead projectors weigh even more, and you’ll have to bring your own unless there’s one provided at your destination. Although the LCD projectors are self-contained, certain models can weigh nearly 30 pounds! For either system, plan on carrying a projection screen unless one is provided. Electronic technologies develop so rapidly it’s not surprising to see LCD screens being followed by a newcomer, Digital Light Processing (DLP). This breakthrough promises better image resolution, smaller and lighter projection units, clear projections in well-lit rooms, and low prices. The most distinct advantage this system has is that it reflects light off an image instead of transmitting it through a screen. The key to this new process is the Digital Micromirror Device (DMD). This is a thumbnail-sized microchip with a reflective surface made from more than 500,000 tiny aluminum alloy mirrors. A memory cell beneath each mirror can be activated by a simple binary code. The signal tilts certain mirrors towards an ON direction, reflecting light through a lens system; others tilt to the OFF position, directing unwanted light into absorbing material within the projector. High-end DLP units split an initial beam of light into three base colors using prisms, each color beam is bounced off a chip, then they are merged back into one. Inexpensive units use a “color wheel” to briefly flash different colors from a lone shaft of light onto a single or double chip system. The image on the mirrored chip is updated as each colored section of the wheel passes through the light. The separate color images are projected onto the screen in such rapid succession that the human eye detects them as a single picture. • No light is lost due to saturation. DLP’s light beams are split with prisms and bounced off a mirrored surface, not sent through polarized mirrors and darkened screens. This allows for a much brighter projection in well-lit areas. 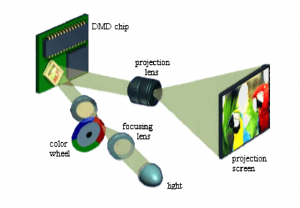 • There is less space between mirrors on a DMD chip than between pixels on an LCD screen. This helps eliminate visible traces of the grid pattern and increases the picture’s resolution. • Being semiconductor-based lets DLP broadcast flicker-free video that, unlike CRT projections, won’t “drift”. • DLP images are updated in microseconds, as opposed to the slower milliseconds with LCD. • Current DMD chips can hold 848 x 600 mirrors, but later versions will contain arrays as high as 2048 x 1152. Perhaps the most important sign of its future success is that several companies are currently working on their own versions of DLP projectors. This is a product that is definitely worth keeping your eye on. Anyone who’s ever shared a wall with someone else has probably wondered if the walls were intentionally thin, or the neighbors intentionally loud. Often the assumption is that the walls between dwellings simply need to be thicker to muffle sound. The fact is that the design of the wall, not the size, can be a contributing factor in transmitting sound from one side to the other. Consider how walls are constructed in most multi-family housing units. Basically, they are made of gypsum board firmly attached to both sides of a wood frame. When sound waves hit one side of the wall it causes the gypsum board on that side to vibrate. 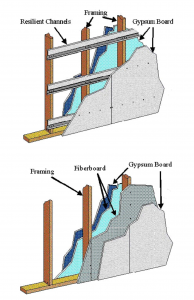 Since the gypsum board is rigidly connected to the frame, the vibration is transmitted right through the framing to the gypsum board on the other side. Those same vibrations traveling through the wall frame can also send sound throughout adjacent floors and ceilings. Noises will radiate through the structure because there’s almost nothing there to cushion or absorb the sound waves. 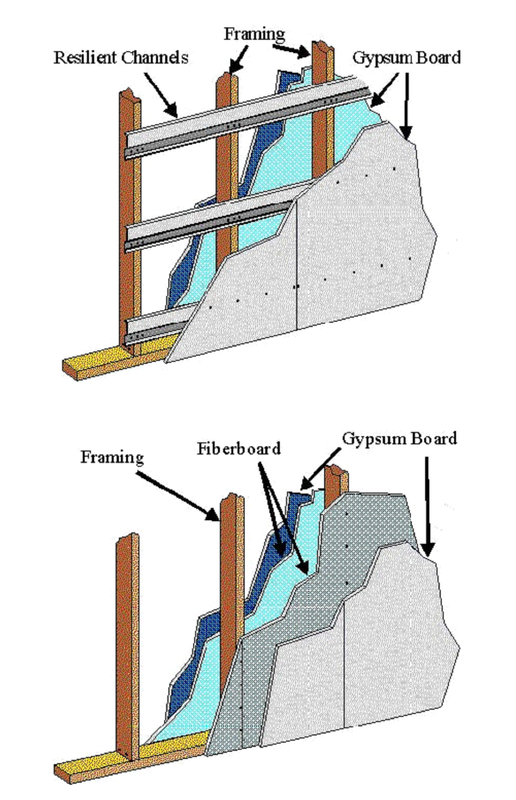 In order to dampen those approaching sound waves, resilient furring channels can be inserted between one of the gypsum walls and the frame. The resilient channel acts as a shock absorber in this system, muffling vibrations coming from either side of the wall. Resilient channels are routinely used to improve the sound ratings for walls and are especially effective in floor/ceiling constructions. Resilient channels typically add 3 to 5 Sound Transmission Class (STC) points to an otherwise identical wall or ceiling. This can often be enough to meet the STC and Impact Insulation Class (IIC) ratings required by the project design goals or local codes. In California, the building code specifies minimum lab tested ratings of STC 50 and IIC 50 for partitions in multi-family dwellings. In fact, the IIC 50 rating required by the building code almost mandates the use of resilient channels to hang the ceiling in a multi-family project. Unless the floors are completely carpeted (which is rare for kitchens and bathrooms), it is very difficult to achieve IIC 50 ratings without using resilient channels and batt insulation in the floor-ceiling construction. 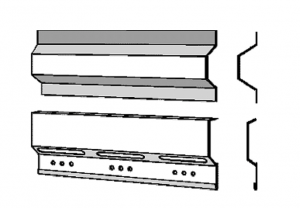 It is important to distinguish acoustically effective resilient channels from hat channels, z-channels, and other lightweight metal furring systems. These other systems may resemble resilient channels, but they afford no movement and are simply too rigid to be effective. Only resilient channels have any acoustical benefit. 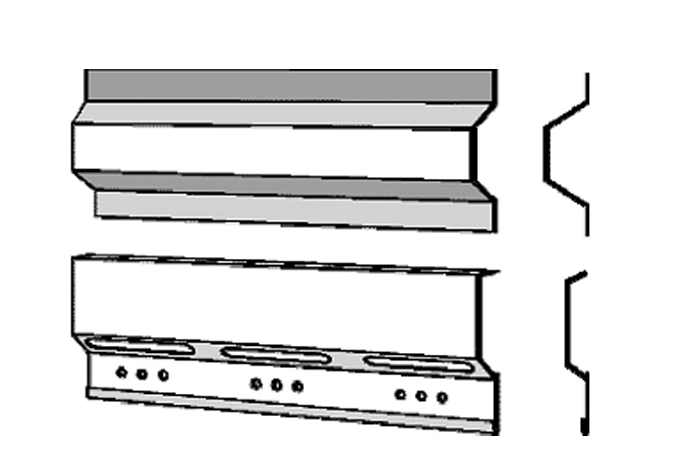 As can be seen in the diagram above, resilient channels have two flanges, one wide and the other narrow, with a slotted portion in the middle. These slots create the flexibility which allow the resilient channel to act as an isolator. Every manufacturer has a different design for resilient channels. Assuming they are installed correctly, the ones with the least amount of material connecting the wide and narrow flanges will (in theory) transmit the least amount of sound. Regardless of which brand of resilient channel is used, it is extremely important to install them correctly. Improper installation will nullify any advantage you would have gained from using them in the first place. On a recent project, it took one unfortunate contractor two tries before he finally got it right. On his first attempt, he mistakenly put in a hat channel system. The second time, he correctly installed three different kinds of resilient channels, none of which was the brand specified in the design. The third time around everything went as planned. Luckily, both of the contractor’s mistakes were caught before the gypsum board had been hung. There are a few simple procedures that need to be followed when using resilient channels. On walls, the channel should be mounted perpendicular to the framing with the narrow flange along the bottom. This allows the gypsum board’s weight to draw itself away from the framing. For ceilings, the flanges should all be pointing in one direction. This keeps the channels from fighting each other. When fastening the gypsum boards, the screws must be connected to the channels between the studs or joists. It is critical not to “short out” the resilient channels by screwing into the wood behind them. This inflexible connection destroys the benefit of the channels, and you have now spent a lot of time and money to create a complex rigid attachment. 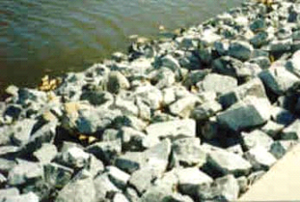 The resilient channels should be held back from intersecting surfaces about an inch on the side edges, and about 2 to 3 inches at the top and bottom of the wall. It does little good to carefully attach the channels in the middle of the wall when the baseboard screws connect the entire bottom edge to the sill plates. Similarly, it is easy to short out the resilient channels at the top of the wall by screwing into headers. The gypsum boards attached to the channels also need to be held back one-quarter inch from similar intersecting surfaces. If the panels are jammed against the edges, then they will be rendered ineffective. The gaps should then be sealed airtight with a specified acoustic caulking. For a more aesthetic effect, the caulked edges can be painted or covered by a trim. When resilient channels are properly installed, it should be possible to slightly flex the wall or ceiling surface. A lack of flex indicates that the channels are shorted out by screws fastened into the wood framing. Also, it usually does not matter which side of the wall is resiliently suspended. This makes it easier to accommodate shear plywood and wall mounted cabinets–simply put the resilient channels on the opposite side of the wall in the affected rooms. Keep in mind that this article only outlines the benefits of correctly installed resilient channels. If you feel that this technology would be useful in an upcoming project, it is advisable to seek help from an experienced consultant. One particular contractor already knows how much easier it is to get things right the first time around. Sound Transmission Class (STC)–Describes how much sound a wall or floor/ceiling construction will block from one room to the next. STC is applied to situations where speech or office noise constitutes the main sound problem. To determine the rating, an active loudspeaker is placed on one side of the partition, and sound levels are measured on both sides. The difference in levels shows how much sound can be blocked by the partition. The higher the rating, the better the sound insulation properties. Impact Insulation Class (IIC)–Measures the noise created by foot-falls/impact on a floor through a ceiling. A really expensive but standardized testing device generates the impact sound by dropping 5 hammers which impart a known energy into the floor/ceiling construction. In the receiving room below, the resulting sound pressure level is measured in frequency bandwidths comparable to those used in sound transmission loss measurements. Increasing IIC values correspond to improved impact noise dampening qualities. Video Conferencing – What Does It Mean For You? Canon saved about $200,000 during 1993-94…the US Navy’s distance learning network saved over $4 million over a four-year period…and Norfolk Southern Railroad saved $1,080,000 over an 18-month period. How? By video conferencing! A number of our clients are upgrading their systems, or reconsidering video conferencing. To paraphrase one of our clients, “…a person needs to be there to facilitate the work, not to have a meeting”. With the increase in travel costs and expansion of offices, companies are forced to fully utilize their time and available resources. At the same time, system and communication costs are falling and quality is improving. This is helping video conferencing expand. New applications, opening in many different fields, are also proving the cost effectiveness of video conferencing: educators use it as a convenient means for interactive access to classes, meetings and learning resources from remote locations, physicians use it to provide consultations, courts use it to increase security of prisoners and conduct video arraignments. • Desktop Systems are the least costly of the three basic types and are now being promoted by Intel and Apple. In its simplest form, this system involves setting up a camera, monitor, microphone, and loudspeaker in two rooms and connecting them together on a computer network. The limitation of this system is that it is designed for use by one person at each end, as opposed to larger groups. • Roll About Systems can be moved from room to room. Built at a manufacturing facility and shipped to the site, installation teams are usually on-site for less than one day. There is no need for local inspections or approvals and if the client plans to upgrade in the future, the components of this system can typically be integrated into a larger system. • Fixed Systems are built into a dedicated video conference suite, which houses all of the necessary equipment. This is generally the most expensive option, especially if an existing shell space is being modified. Inspections and approvals are needed and installation and construction teams are usually on-site for extended periods of time. One of the first things a new user will notice when viewing a video conference for the first time is the relatively low quality of the picture compared to normal TV. Many people do not realize that the actual picture will not necessarily be in real time, either. Companies are upgrading their systems for these very reasons…to obtain better image resolution and faster transfer of video images. As occurred in the computer industry, much of the video conferencing technology is quickly outdated and surpassed by the quality and speed of new equipment. Frame Rate is the number of individual video “pictures” that are displayed on the screen in a given time period. Frame rates are expressed in frames per second (fps). With higher frame rates the participants look more real and movements are less choppy. Frame rates in video conferencing systems can vary from 5 fps to the 30 fps used in standard TV. Resolution is the number of individual picture “information dots” displayed horizontally and vertically in each frame. The number of horizontal lines that are displayed per frame is a fixed display television standard. The number of information dots displayed in each of these lines is what differs. Similar to a fax machine, video conferencing systems break the video information down into digital data by sampling it many times per second. The higher the sample rate, the more information dots are gathered for each frame and the clearer the picture. Motion Handling is a function of each individual CODEC. To increase performance and reduce the amount of information being transmitted between sites, CODECs do not transmit the whole picture, only the changes in a picture between two frames. This means that pictures with very little movement have only small packages of information to transmit. As the amount of movement increases, the amount of information to transfer from site to site increases. The Data Rate is the number of bits of information that can be transmitted per second. In other words, the data rate is the size of the information pipeline. Determined by cost and availability of equipment, the data rate is a fixed number established at the start of a conference. Because the CODEC has no control over the data rate or the movement of the participants during a conference, the frame rate and resolution must be adjusted to accommodate the amount of information being transmitted through the information pipeline. In most systems, the resolution is fixed at the lowest usable value and the frame rate is adjusted accordingly. Higher data rates allow either better frame rates or higher resolutions (these can be “traded off” depending on the requirements of the CODEC). What’s the Bottom Line? Despite their costly beginning, video conferencing systems have now become more affordable. This can be attributed to the significant drop in cost of ISDN data lines. In fact, they now cost about one fifth the amount they were a few years ago. As a result, clients can increase their number of ISDN lines for a reasonable cost, and obtain higher transmission speeds and a more natural image. Our clients have found that three ISDN lines provides an acceptable level of quality. Video conferencing has become a cost-effective media which is proving both profitable and worthwhile in many industries. It provides clear, enhanced communications, reduced travel expenses, and a competitive edge in the technology-driven business climate that lies ahead. Analog- A method of sending signals — voice, video, data — in which the transmitted signal is analogous to the original signal. Analog technology uses continuously changing electrical waves to generate voice or low speed data signals. Bandwidth- The range of frequencies over which signal amplitude remains constant (within some limit) as it is passed through a system. Broadband- Digital services at rates greater than 1.544 Mbps. CODEC- Acronym for COder/DECoder. A video and/or audio bandwidth digital compression device. Digital- A method of sending and receiving information. Transmission- coded with on-and-off pulses of electricity or light. Encryption- Code conversion of digitally coded signal values, performed, in general, without any increase of bit rate, in order to prevent unauthorized reception of a signal. ISDN- Integrated Services Digital Network. International Standard for digital services on the public switched telephone network. MCU- Multipoint Control Unit. A switching device commonly used to switch and control a video conferencing network allowing multiple sites to conference simultaneously. Teleconferencing, holding meetings by an electronic means, is one of the fastest growing industries in the world. The word “teleconferencing” means different things to different people. Teleconferencing can range from a conference call with speaker phones to a system with installed overhead speakers and tabletop microphones, to a full scale audio for video conferencing system with satellite feeds. Regardless of the type of teleconferencing, how the audio portion of your conference is handled will ultimately determine the success of the system and satisfaction with the event. Every meeting starts with “can you hear me?” or thud, thud, thud as a person taps a hand on the microphone. Remember the last time you went to a movie where the theater had problems with the soundtrack? It’s the same with teleconferencing. Even if you have perfect video, audio problems will destroy the conference. One of the biggest problems in teleconferencing is background noise. When you are in a conference or meeting room and you hear background noise such as duct rumble, diffuser noise, or a computer fan, you for example, individually, tend to block out or ignore the noise because you have been able to identify its source. In a teleconference, however, this background noise is transmitted to the distant location along with the sound of your voice. There is no longer a method for the listeners at the other end to distinguish where that noise came from. The noise becomes distracting and masks over the spoken word. The proper acoustical treatment of any room with teleconferencing is extremely important to the success of that conference. If more than one microphone is used, it is also very beneficial to have an automatic microphone mixer that limits the number of microphones that are active and turns on the microphone nearest to the person speaking. If the only active microphone is the one closest to the person speaking, the intelligibility of the conference will be much higher. Ceiling-mounted microphones contribute to the attractiveness of the conference room, but at the other side of the conference, it sounds like the participants are not talking into the microphone. The further someone is from the mic, the greater the chance that background noise will drown them out. The best idea is to place the microphones close to the people speaking. Another source of trouble in teleconferencing is the phenomenon known as “acoustic echo”. Acoustic echo appears when the conference room is operating with open mics and loudspeakers in full duplex conference mode. A full duplex conference mode is when you and the distant room can have a one-on-one communication without having to wait for the other room to stop talking. Electronic audio signals are sent in both directions simultaneously. In this situation, your audio goes over the transmission media to the speakers in the distant room. The audio is then picked up by the open microphones in that room and retransmitted to you. The result is that you will hear your own voice coming back to you from the far room, thus the echo. This effect is similar to talking over a public address system in a stadium — highly confusing. Fortunately, acoustic echo can be minimized. It is very easy to remedy the problem by installing an acoustic echo canceller. An echo canceller looks at the audio coming into the room from the loudspeakers, and compares it to the audio from the microphone. Any audio that “matches” is removed from the transmission. However, to keep your installed in the distant room. This means that you will need an echo canceller in every room that is part of your conference. Remember, an echo canceller compares the audio from the loudspeakers to the audio from the microphones. Your best bet is to put an echo canceller in each room. This will assure that none of the rooms can create an echo condition. Teleconference equipment can be easily installed in existing conference rooms. The best test for proper operation will be made with everyone’s ears. And don’t forget the audio. Thanks for the great documentation. Every time I have a question I can go to the documents to get the answer.